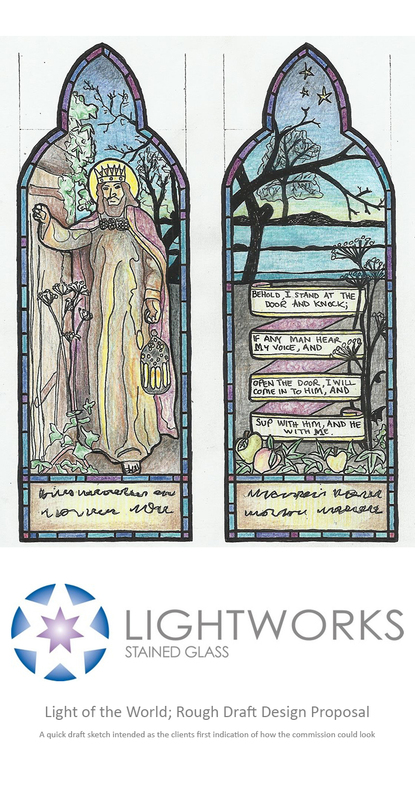 We were recently approached by a private client with an interesting proposal; to produce a new double light window incorporating “The light of the world” by William Holman Hunt. We of course jumped at the opportunity to work with the Pre-Raphaelites! 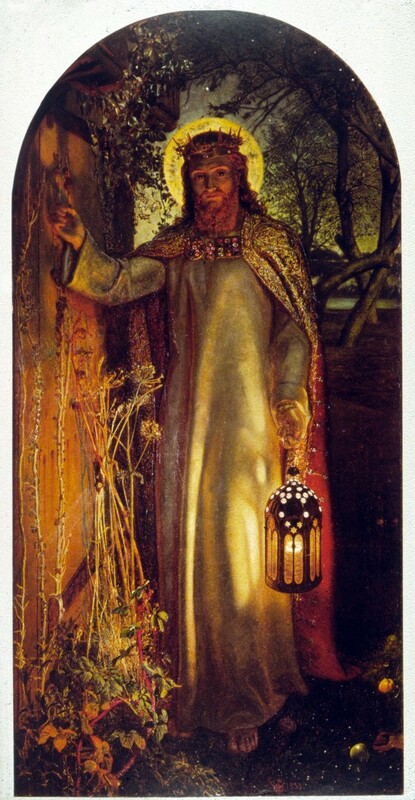 “The light of the world” was painted by Hunt in 1851-3 and was inspired by Revelations 3:20; “Behold, I stand at the door and knock; if any man hear my voice, and open the door, I will come in to him, and sup with him, and he with me.” It depicts Christ, seen at dusk, knocking on an over-grown wooden door, in His hand, a lantern emitting golden light into the relative gloom. It is an internationally renowned work of art which today can be found at Keble College, Oxford. In attempting to achieve our clients brief, our immediate challenge would be to represent a single image over the two lancet lights? Our solution; to keep the original image of “The light of the world” to the left hand lancet. In the right hand, to carry through the beautiful colours, fallen apples, leaves and seed heads which together with Hunt’s excellent use of light and shade beautifully capture the essence of an autumnal dusk. In striving to maintain a strong tie to the original image within the left lancet, we decided that stretching the landscape into the right lancet would be the perfect way to achieve this. It would allow us to use the dusky sunset as a more stimulating background and create the space to introduce the passage from Revelations into the main body of the design in the form of a scroll. As an additional visual tie we will continue the organic shapes to the foreground and the textures of the fabric of Christ’s robe to the back of the scroll. You cannot look at the work of Holman Hunt and his fellow Pre-Raphaelites without appreciating their vivid and enthusiastic use of colour. One of the many creative challenges as a stained glass artist is selecting the correct type and colour of glass and this commission will certainly challenge us in attempting to match the colours of the original. In doing so, we look to draw from the vast selection of beautiful mouth-blown cylinder glasses available to us. We have worked our basic thumbnail sketches and ideas up to a rough design proposal which has now been agreed in principal by the client, the church and the Diocesan Advisory Committee. Our next challenge is to develop this proposal sketch into a large format fully coloured and detailed working presentation design. As well as providing both ourselves and the client a much better visual representation of how the finished commission will look, it will also allow us to contemplate its technical and construction issues including painted detailing, lead lines, split lines & supporting saddle bar placement. The images shows Holman Hunts original painting “The Light of the World” and Lightworks rough draft design, produced by Abigail Fielding.